Are you feeling fragmented and overwhelmed this Fall? 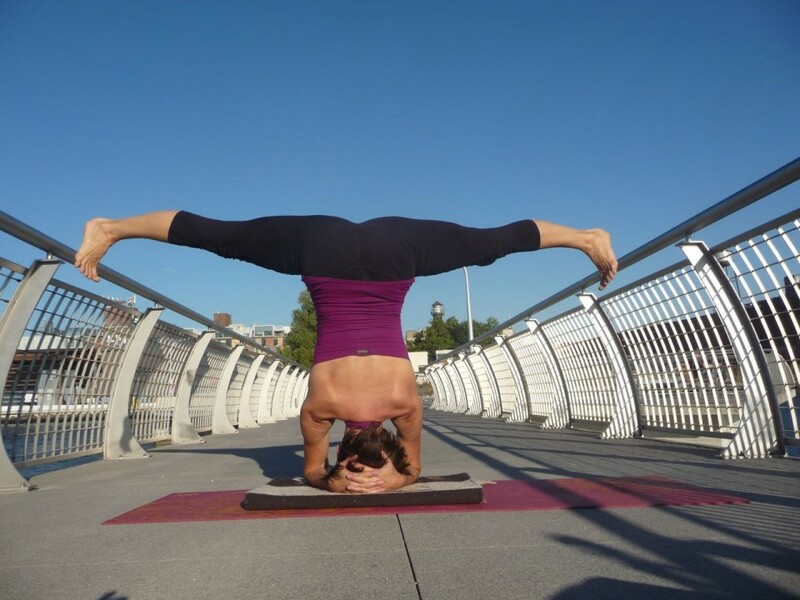 Spend a little more time upside down with Leigh and deepen your powers of concentration! I’m truly enjoying my headstand practice this Fall. I have always loved being upside down. I can remember as a kid hanging out alot in shoulderstand on the cushioned ledge in our dining room. I also could be found dangling upside down for hours on the swing in our tree in the backyard. The first person I knew in my life that did headstands was my grandfather, Albert Evans. He had a 33 minute daily exercise practice which included a 3 minute headstand. I was inspired by his daily dedication and he was in amazing shape! It made a real impression on me. I always feel so nourished by my inversion practice. I am much more able to concentrate. The day goes smoother and I really get a lot more done. Distractions fall away and I can stay focused and on task. I increase the time I spend in inversions in the Fall to stay balanced and centered in our “windy season”. In Fall, Vata Dosha (the air element) increases and we often feel fragmented, overwhelmed, exhausted, anxious, nervous, scattered, and distracted. When our vata dosha gets out of balance, we experience our thoughts running a mile a minute resulting often in insomnia. Inversions help us quiet the mind and deepen our concentration in addition to the enormous cleansing and healing benefits for our immune, digestive, reproductive, circulatory, endocrine, and nervous systems. Try spending a little more time upside down this Fall! Oh, and if you’re having trouble falling asleep, or wake up in the middle of the night and can’t get back to sleep, just listen to my “Sleep & the Art of Rest” audio sessions–Guided relaxation and breathing practices to help you unwind, ease your mind, and summon sleep! Enjoy! 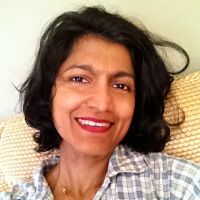 Annie Kunjappy was born and raised in Malaysia by immigrant parents from Kerala, India. 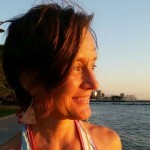 She has been in New York since 2004, spreading her knowledge and love for food and conscious eating. 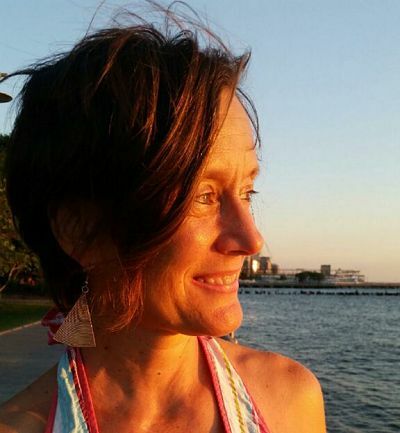 Annie will be leading the food portion of our Seasonal Self-Care workshops on November 1 (Winter Wellness) and April 3 (Spring Detox). How do you know Leigh? Leigh was my first yoga teacher! She started teaching her first yoga class at the warehouse loft space where I lived in San Francisco in 1990. I feel that her amazing teaching laid a strong foundation for my yoga practice in the years to come. We were both artists in the theater/dance/ performance world and have collaborated on several projects over the years. Have you always been interested in food? When did you realize you would have a career as a chef? My mother was a fabulous cook, so I had the good fortune of growing up eating very good food! I have always loved delicious, creative food, but my specific interest in food and healing came about from my own investigations into healing myself from eczema and other sensitivities that had plagued me since childhood. Western doctors at that time offered very little beyond steroids and cortisol creams as salves for the symptoms. My “return” to Eastern medicine and particularly to discovering the power of the daily practice of conscious eating was what finally healed me. This lead me to getting trained as a chef specializing in food and healing. You studied and taught at the Natural Gourmet Institute for Health and Culinary Arts. How did you decide on that specific program? What was it like going from student to instructor? The Natural Gourmet Institute offered a program that included the study of Ayurveda, Chinese 5-phase Theory, Macrobiotics, etc. Their approach to gourmet cooking had, at its heart, a devotion to health and healing. Your approach to to nutrition and self-care is based on Ayurveda, Chinese Medicine and western nutritional science. Can you explain how you integrate all of these “systems” into one? Each tradition has fine-tuned it’s approach based on the truths of their environment, culture, history and value system. They have their differences and underlying similarities. I do not integrate all these systems into one by any means. Each person, under their specific set of conditions will ideally learn to address their own physical and spiritual needs informed and aided by the richness offered by these various approaches. What can people expect from your upcoming seasonal attunement workshops? Is it accessible to people who have not been exposed to ayurevda, chinese medicine and seasonal practices? It is designed to be accessible to the newcomer with plenty of inspiration for further study and investigation. There will be very do-able recipes and easy to follow charts, etc. to take home and start your own practice. New Yorkers tend to be perfectionists. Is there a way to eat “perfectly” for the seasons? How would you suggest people approach a seasonal diet? With a keen sense of listening to your own body, curiosity, and flexibility. When you eat in alignment with the seasons, how do you feel? Vital, energetic, strong, healthy. Not suffering from overheating in the summer, nor freezing in the winter. There is a sense of flow and ease. You are also a performer. Do your two passions ever intermingle? Hmmm….. “free time”? Time is time for me… I write and paint and read and do fun things with my family and friends…. If you could go anyplace in the world, right now, where would it be and why? Autumn invites us to let go, lighten up, and distill our beings to their essence. Tune up the metal element this Fall with practices that help you clear out the clutter in you mind and define your intention with clarity. Crystal clear light, vast blue skies, and crisp, cold, clear air—ahhh Fall, my favorite season is here! According to Chinese Medicine, Fall is the Season of the metal element. The stage in our yearly cycle, when all of nature is in a process of contraction, decay, and decomposition-returning all matter to source to fertilize the seeds of Spring’s rebirth. Through a process of releasing and refining, the metal element transforms matter to pure essence. The Autumn leaves, brilliantly ablaze, offer their last bursts of vitality before drying up and dropping back to the earth. In the end, the essence of the tree remains, a sculpture carving a line drawing in the vast sky and the unseen roots below, stabilizing, grounding and nourishing. The sap of the tree draws into the interior of the tree and sinks back to the roots. In Fall, we also pull inwards, slow down, and become more internal to refine our being as we move towards the stillness and rest of Winter. Fall is the time to cleanse and organize the clutter in your home, release the agitation in your mind, and clear out the chaos in your life. It’s time to shed the non-essential, resolve and release unhelpful habitual thoughts and emotions, and let go of unhealthy relationships and patterns. By releasing the non-beneficial, we create space for recognizing the essence of who we are and clarity for our intentions. But letting go is not easy, we resist it. Often we don’t want to change. We want to hang onto Summer, our youthful yang energy, the fullness of the day. We get fearful of the dark, the time and space needed to nourish the new. The stillness and quietness is unsettling and a sort of anxiety sets in as we head towards the fallow Yin time of Winter. We are used to constant stimulus, distraction, and busyness. But this nonstop activity and productivity with little rest, leaves us depleted, stressed out, and burnt out. In the Fall we often need supportive practices to help us as we undergo these elemental processes of letting go, releasing, and surrender. Seasonal yoga, food, and lifestyle practices can help us attune our internal rhythm more with the natural cycles and deepen our connection to ourselves and our environment. Fall is a good time to nourish the internal practices of meditation, mantra, and mudra to quiet the agitation in the mind, deepen concentration and open insight. 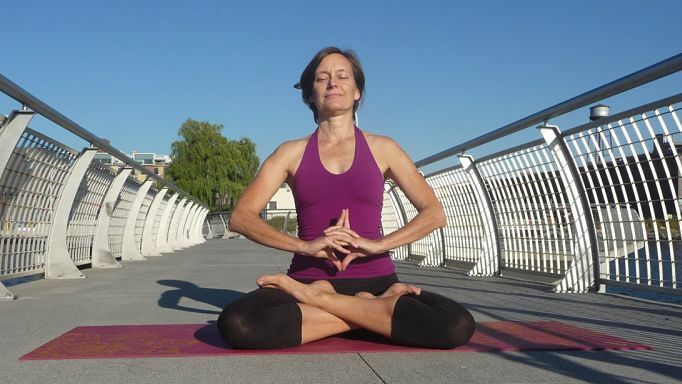 Try practicing Uttarabodhi Mudra this Fall to nourish the metal element and the lungs and large intestines, our Fall organs. Place your index fingers together facing upwards and thumbs together facing downwards. Interlace the rest of your fingers together. Breathe and enjoy! This mudra helps open the lungs to expand the inhalation as well as stimulates elimination through the large intenstines. As conductor of electrical and energetic impulses, the metal element enhances our ability to draw in prana (vital energy) from our environment, connect with cosmic energy, as well as recharge our inner source of wellbeing.